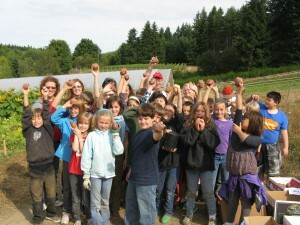 In 2010, EduCulture broke new ground by helping to start the Bite of Bainbridge program with the Bainbridge Island School District. Each year, hundreds of pounds of produce grown by Island students and farmers are featured in the school lunch program. In early October, locally grown corn raised by Karen Selvar of Bainbridge Island Farms (BHS Class of ’82) was served in school lunches throughout the school district. BISD once again purchased 300 pounds of Akio Suyematsu’s Raspberries (BHS Class of ’42, raised by Karen Selvar since Akio’s passing), served at Bainbridge High School in yogurt and granola parfaits. The raspberries are also served at Sakai and Woodward Schools as a topping for waffles during their Breakfast for Lunch specials. On November 26, the featured Bite of Bainbridge in Island Elementary Schools will be locally grown and student sown potatoes, seeded last spring and harvested this fall by more than 20 K-4 classes from Wilkes, Ordway and Blakely Elementary Schools. These Cherry Red, Purple Caribe, and Yukon Gold potatoes were raised organically at our edible education plots at Butler Green Farms on Morales Farm and Heyday Farm on McDonald Avenue. 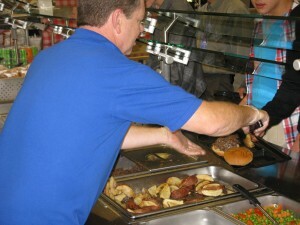 Click here to read the BISD elementary school menu for Nov. 26. On Bainbridge Island, we are fortunate to have a continuum of school and community that goes back over 150 years. 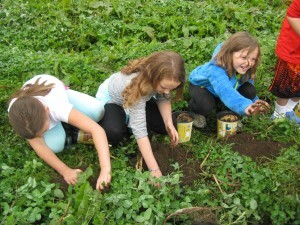 What is extra special about our Bite of Bainbridge program is how locally grown and intergenerational it has become. We are fortunate to be in a school district in which food served in our school lunches is being raised by three generations who grew up on this Island and representing nine decades of educational and agricultural life in our local community. We are proud to have had a role in building the bridges to create a dedicated locally grown school food stream within the Bainbridge School District. While still “bites,” they represent a significant place in the school food chain, and allow students to have learning experiences, from production to processing to distribution to consumption. What started for these young people as an educational act, is not only feeding their minds, it is also feeding their bodies. It may be small in servings right now, but the Bite of Bainbridge program packs a full educational meal. This program is becoming a model of school-community partnerships on both public and private farmlands. Each year, with the continued support from our school, farm and community stakeholders, we are moving the Bite of Bainbridge program from the novelty to the norm. This entry was posted in Uncategorized by Managing Director. Bookmark the permalink.